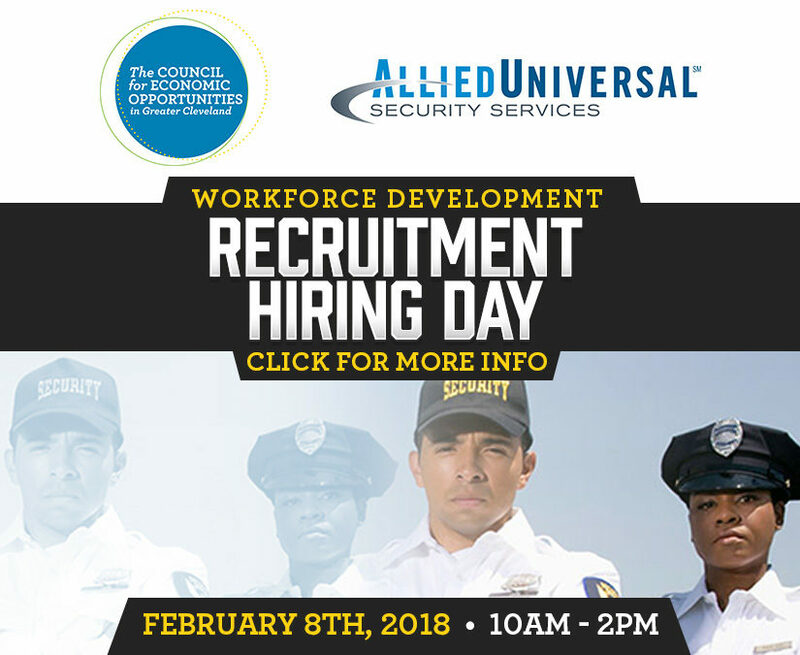 The Council for Economic Opportunities in Greater Cleveland will once again collaborate with Allied Universal to host its first Recruitment Day event of the new year. This will the fifth time Allied Universal has partnered with CEOGC in the last two years. The security company, headquartered in Pennsylvania, has 50+ lobby ambassador customer service jobs available throughout downtown Cleveland including Cleveland Clinic, and University Hospitals. Positions available include uniformed officers, healthcare officers, supervisory roles and lobby ambassadors. The event will take place on February 8, beginning at 10 a.m. to 2 p.m. at 1801 Superior Ave, Suite 400 // Cleveland, OH 44114. On-the-spot interviews will be conducted, so come dressed professionally, bring your resume and prepare to receive the perfect job you’ve been searching for! We look forward to seeing you here!